Kelsey R. Campbell, 20, reaches a plea deal in which she would spend a year in jail. 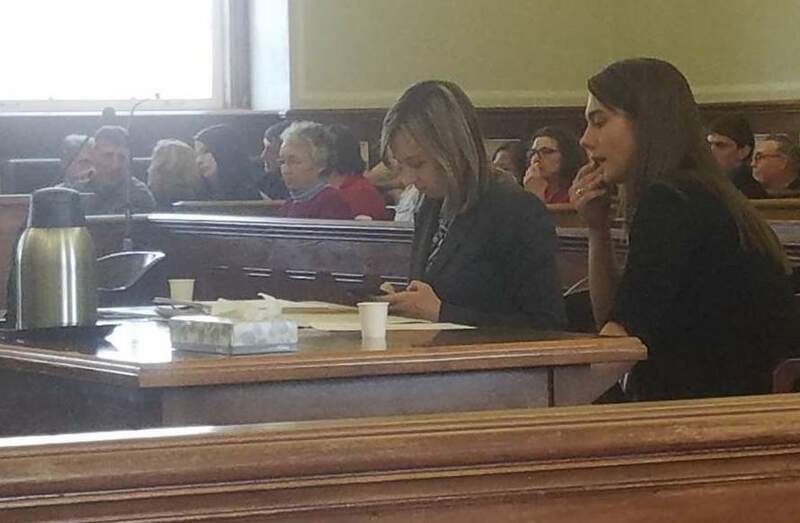 ROCKLAND — A 20-year-old South Thomaston woman will serve no more than a year in jail for a crash last year that claimed the life of one of her passengers. Kelsey R. Campbell pleaded no contest Thursday in Knox County Superior Court to aggravated criminal operating under the influence and operating beyond license condition or restriction. A more serious charge of manslaughter was dismissed. Justice Bruce Mallonee accepted a plea deal in which Campbell will be sentenced to seven years in prison with all but one year suspended. She will be placed on probation for three years after her release. She will not be formally sentenced for a year, however, and she will be free during that time. Campbell agreed to surrender her motor vehicle license immediately and for the next year. Mallonee said that by delaying for a year when Campbell begins her sentence, the state will have an additional year to monitor her. If Campbell violates terms of the agreement such as committing another crime, drinking, taking drugs or failing to undergo counseling – the agreement will be nullified and she could serve a substantially longer prison term. The maximum potential sentence for a manslaughter conviction is 30 years in prison. The judge accepted the plea agreement after family members and a friend of Elwell offered emotional testimony about the impact of the young man’s death. His father, Randy Elwell, said his son was a firefighter and the two of them attended a firefighting academy about a year before his death. “I wish you could know how much he loved that. He loved being a firefighter,” Randy Elwell said. “We’ll never have the chance to see if Zach gets married and possibly has children – grandkids for us to spoil – all because of Kelsey being irresponsible that night. There are times that I need a hand with a project and I think ‘I’ll give Zach a call’ and then it hits me hard – he’s not here. Sometimes I cry,” the father said. “Zach always said he only wanted to live in St. George – now he is for eternity,” Randy Elwell said. Campbell sobbed as family members spoke and continued crying as she addressed the judge. She apologized to the family, to the St. George community and to the police, firefighters and emergency medical responders who came to the crash. Assistant District Attorney Christopher Fernald said that the agreement took into account Campbell’s age – 19 at the time of the crash, her ack of a criminal record and her acceptance of responsibility early on in the process, even before the matter went before a grand jury. Campbell was arrested in January on a warrant obtained by the Knox County Sheriff’s Office and has since been free on bail. An affidavit filed in Knox County Unified Court by Knox County Sheriff’s Office Detective Justin Twitchell stated that Campbell had a blood-alcohol level of 0.21 – more than twice the limit at which a person is considered under the influence in Maine. In addition, two witnesses reported that a 2004 Subaru Outback passed them on Route 131 in South Thomaston at a high rate of speed. One of the motorists estimated that the vehicle was traveling 85 mph in the 50-mph zone. Another motorist said she saw a woman driving the car, laughing as the vehicle passed at a high rate of speed. Campbell’s attorney had attempted to have the court suppress the blood test taken at the hospital and statements Campbell made to police and emergency medical personnel in the presence of police following the crash. No hearings were held on those motions before the sentence agreement was reached between the two sides. Elwell’s family members voiced opposition to Campbell being allowed to wait a year before she begins her year jail term but the family’s attorney, Alison Wholey Briggs, said after the hearing that the family was pleased that Mallonee demanded that she surrender her license immediately. More than a dozen family members and friends of Elwell were in the courtroom. Campbell’s mother and a family friend also attended the two-hour hearing. The operating beyond license restriction charge stems from her having consumed any alcohol, which is prohibited for drivers under 21.